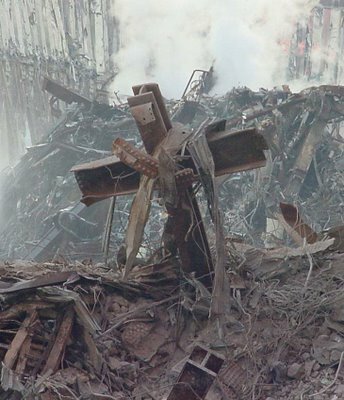 Two days after 9/11, firemen discovered a cross in the ruins of the north tower, the remains of two intersecting beams. The cross came to symbolise the grief of many people at that time and is now on display in New York as a memorial to those who perished on that day. It would seem, however, that this particular cross had a larger, more universal meaning than may previously have been attributed to it. Using visual symbolism, gematria and bible numerics I will show that 9/11 was the first act in a two-part drama, with an eschatologically-meaningful interlude of three-and-a-half years. These events, taken together, symbolise the Crucifixion and Resurrection of Jesus Christ. This gives us the first version of the Superscription. Here it is, along with it's ordinal value. The number 343 is 7 x 7 x 7 and therefore the cube of 7. The cube is a symbol of perfection and the holiest object in Judaism, associated with the Most Holy Place in the Tabernacle and later the Temple in Jerusalem. This was always a perfect cube in shape, with external dimensions of 10 x 10 x 10 cubits in the Tabernacle and 20 x 20 x 20 cubits in the Temple. The New Jerusalem is also a cube, with dimensions 12000 x 12000 x 12000 stadia. 1. The ordinal value of the Superscription, 343, is the cube of 7. Additionally, seven is the number of spiritual perfection, so the cube of 7 is both a symbol of perfection and holiness and the triple expression of spiritual perfection. 2. The number of words in the Superscription is 8, the cube of 2. 3. The number of letters is 27, the cube of 3. 4. The chapter number is also 27. 5. The sum of the chapter and verse indicators, 27 and 37, is 64, the cube of 4. Also, the product of 27 and 37 is 999, which is the triple expresion of nine, the number of endings, judgment, finality, fruits and suffering. So Matthew 27.37 is encoded with the geometry of the cube: the symbol of perfection and the form of the Most Holy Place. We can see that these encodings are associating the cube with Jesus Christ, our 'most holy place', whose perfection is symbolised by the holiest of all objects in Judaism. The targets of the 9/11 attacks were properly called The World Trade Centre and The Pentagon. These names have ordinal values that imply two numerical cubes, one of which is contained within the other. The cubes are displayed below. Therefore the two buildings at the centre of the 9/11 drama appear to encode cube 343, which is the same cube found in Matthew's version of the Superscription. Not only that, but an important structural component of cube 343 is also implied: the outer shell of 218 counters. This is even more like the Most Holy Place, which is also a cubic shell. Another way 343 was encoded into 9/11 was the sobering fact that 343 firefighters died in their heroic efforts to put out the fires in the twin towers. As you will see, the casualty lists include further cubes. The Superscription is obviously associated with another geometric form, the Latin cross, and through an operation symbolised by the 9/11 attacks, the number 218 can be seen to represent both objects. The cubic shell of 218 units I found above, symbolising the Most Holy Place, can be opened out in similar fashion to reveal a cross. So the World Trade Centre represented the Most Holy Place through the shape of cubic shell. After being symbolically cut on 9/11, this cube 'opened out' to become a cross, which I will show represented the cross on which Jesus was crucified. This also resonates with the entry into the Most Holy Place by the High Priest on the Day of Atonement. The geometric metaphor is completed in The September-11 Cube. The twin towers were individually named 'the North Tower' and 'the South Tower' (these names are on the architect’s plans for the WTC complex). As if to underline the point that these towers represented both a sanctuary and a cross, the summed ordinal values of ‘the North Tower’ and ‘the South Tower’ give the exact number of units required to surround cube 343 to create another shell - which of course also opens out to form a cross! 386 is also the standard value of one of the Hebrew names for Jesus: Yeshua. So in addition to symbolising the Cross, the towers were marked with the name of the one who was crucified. The proper Hebrew/Aramaic name for Jesus is Yehoshua. Yeshua is a shorter form, left when the letter hey is subtracted from Yehoshua. Just as the addition of a hey is a sign of God's approval (e.g., Abram became Abraham when he was charged with leading the Israelites out of Egypt), so the subtraction of a hey is a sign of disapproval, suggesting that the twin towers were marked for destruction. How could the name Jesus be connected with God's disapproval? Because Jesus was "... numbered with the transgressors ..." (Luke 22.37, NIV). The numbering of Jesus "with the transgressors" is particularly shown in the reduced value for 'Jesus', which is 11, the biblical number of disintegration, disorder, imperfection and disorganisation. The cluster of elevens around 9/11, a day of much disintegration and disorder, was a beacon signalling to those with 'ears to hear' that 9/11 had a biblical dimension. I should mention one more finding here. The usual English translation of the name of the man held responsible for 9/11, Osama bin Laden, had an ordinal value of 110, and so it is also codemarked with the key number 11. The name he purportedly used after 9/11, 'Osama bin Muhammad bin Laden', has an ov of 209, or 11 x 19. The standard value of his name again points to 9/11 being a crucifixion. How could both the World Trade Centre and Osama bin Laden represent the Cross? I would suggest it was through what they stood for, which was avaricious capitalism on the one hand and intolerant fundamentalism on the other. The purpose of a cross was death and each of those systems of thought leads to death. The fact that one was the executioner of the other on 9/11 makes no difference, as both come from fear-driven mindsets and such systems of thought are by nature divisive, destructive and are destined to clash with others. This is why I believe both the towers and bin Laden were marked with 11. The number 218 itself is identified identified with death through gematria. 218, remember, is the ordinal value of 'The World Trade Centre'. Continuing along this vein of geometric gold, solid cube 343 fits inside hollow cube 386 to create a larger solid cube with 729 units. 729 is the triple expression of nine, the biblical number of endings, finality, judgment, fruits and suffering. These are ideas that resonate with both 9/11 and the Crucifixion. Given the biblical meanings of the numbers 9 and 11, we see now that the usual shorthand for the September-11 attacks, '9/11', suggests the idea of God's judgment on an imperfect system. These cubes link the 9/11 targets to the Most Holy Place of the Tabernacle/Temple, and to the Crucifixion through the Superscription in Matthew 27.37. The two outermost shells of cube 729 open out to reveal crosses and through this symbolim and gematria 9/11 is linked to Jesus death on the cross. Genesis 1.1-5 in the NIV Bible, which I call the Garden, is a highly encrypted portion of text, which summarises the entire New Bible Code. Every one of the geometric objects we have been discussing is found in a tight cluster of encoded word strings within the Garden. Overlapping every one of these word strings is a number that represents 9/11 and that ties them all together in a meaningful bundle. The gospels tell us that at the moment of Jesus' death on the cross a remarkable event occurred. 'At that moment the curtain of the temple was torn in two from top to bottom. The earth shook and the rocks split.' (Matthew 27.51) The ordinal value of this verse is 1155 (11 x 105), and as with many verses fitting the pattern of 9/11, the eleven suggests a link to this modern crucifixion. Like the towers, the curtains were huge, imposing affairs, sixty feet high and three inches thick. The tearing of those curtains from top to bottom was mirrored in the fall of the towers, which, after being torn into by the attacking airplanes, fell from top to bottom. There is a rabbinic tradition that in Herod's temple two curtains separated the Most Holy Place from the Holy Place. So both would have been split at the moment of Jesus death on the cross. The two outermost shells of cube 729, then, may have represented this double curtain and the splitting of that curtain was also symbolised by the attacks in New York and by the symbolic splitting of the two shells. The splitting of the curtain was a statement that God was no longer confined to the Most Holy Place and was available to all who would seek him through Jesus Christ. 9/11 can now be seen as another literally crucial moment in our relationship with God. The cube remaining when the outer shell is removed from cube 343 is cube 125, representing the Pentagon. Here it is again. 1. 'The Pentagon (o) = 125, which is 5 cubed. 2. 'Pentagon' (o) = 92, the 8th pentagonal number. 3. The Pentagon building consists of five concentric pentagons, with five storeys. 4. The number of Pentagon employees killed on 9/11 was 125. 5. The number of people killed on Flight 77 which crashed into the Pentgon was 64, the cube of four. There can be little doubt, therefore, that just as the number 11 clustered around the World Trade centre, the number 5 clustered around the Pentagon (work on which officially began on September the 11th, 1941). In addition, both targets were encoded with the most perfect geometric object, the cube. We saw that the cube represents the Most Holy Place and Jesus Christ, our 'most holy place'. In biblical numerics the number 5 represents grace and heavenly favour, again appropriate for Jesus. The figures of the pentagon and related pentagram also have many symbolic associations. For instance, in Pythagorean mysticism the pentagram represented the human being, the five pentagram points representing the head, two arms and two legs - a relationship famously depicted by Leonardo da Vinci, in The Vitruvian Man. However, in Christian symbolism, the pentagon and pentagram are associated with the five wounds received by Jesus Christ as he was crucified. These were the wounds to his two wrists, his two feet and his side. 5. the collapse of WTC 7. In The Day of Atonement I show how these mirrored the five sacrifices on the Day of Atonement, as it was practiced by the ancient Israelites. However, within the context of this part of the message about 9/11, and given the clues suggesting the WTC and the Pentagon symbolised Christ on the cross, they surely also symbolised the five wounds suffered by Jesus during his execution. The figures of the pentagon and pentagram are wedded to the name 'Jesus Christ' through the standard and ordinal values of His name (which, remember, are the backbone of the code). 1. The standard value of ‘Jesus Christ’ is 925. As well as being a diamond number, 925 is also a pentagonal number. 2. The ordinal value of 'Jesus Christ' is 151. The fractal snowflake form of the number 151 plays an integral part in the New Bible Code. However, the number 151 can also be displayed as a centred pentagram. Like 151, the numbers 11 and 911 are also centred pentagram numbers. So 151, 11 and 911 are all geometrically linked to the pentagram and the number 5. 3. The standard value of the correct Hebrew name for Jesus, Yehoshua, is a centred pentagonal number. The centred pentagrams shown above have slightly foreshortened points and thus resemble the physical form of a particular flower that has long been associated with the number 5 and its geometry: the rose. This has five petals at its base and in outline resembles a pentagon or pentagram. The ‘fiveness’ characteristic of all roses is best displayed in the wild rose, which generally has only five petals . In Christian symbolism, the five petals of the rose are associated with the five wounds of Christ - the rose carrying precisely the same as symbolic meaning as the pentagram, which early Christians used as a symbol of the crucified Lord. The use of the red rose to symbolise the crucified Lord was prevalent in the middle ages. For instance, the great 13th Century Christian theologian Albertus Magnus wrote of " . . . the rose made red by the blood of Christ in his passion." The red rose also symbolised the blood of the martyrs who followed in Christ's footsteps and is still associated with martyrdom today. The image of the rose on the cross is an accepted Christian symbol. It is especially associated with esoteric Christianity, which may have led to its use by certain well-known secret societies. However, the symbolism is too profound and significant to be their exclusive preserve, and so it is also accepted within mainstream Christian traditions. In these images the rose symbolises the crucified Lord and therefore we see that the same role was also played by the Pentagon on 9/11. If the attack by flight 77 on the Pentagon represented one of the wounds Christ suffered, then because the Pentagon stood for the crucified Lord that wound would be the piercing of his side by the soldier’s spear. The Bible’s single mention of this incident is John 19.34: 'Instead, one of the soldiers pierced Jesus’ side with a spear, bringing a sudden flow of blood and water'. Here we find another piece of jaw-dropping evidence that these two world-shaking events, separated by huge spans of time and distance, were linked by a common thread of meaning. This is stunning confirmation of the true significance of the strike on the Pentagon! If you are still in doubt about that 9/11 symbolised the Crucifixion, look at further pieces of evidence from the NIV Bible. The first is from Matthew 27.37 again: 'Above his head they placed the written charge against him: THIS IS JESUS, THE KING OF THE JEWS.' The ordinal value of the entire Superscription verse is shown below, along with the very phrase I have just used to describe Jesus on the Cross. Remember also that Jesus was crucified on the eve of the Jewish festival of passover. As usual the number is encoded as an ordinal value and the phrase the encoded number points us to is a standard value - this is consistent almost throughout the New Bible Code. Another mind-boggling link to 9/11 is the positional value of Matthew 27:37, which is the NIV New Testament's 1019th verse, this number having all the digits in '9/11'. Finally, when we concatenate the chapter and verse indictors we obtain 2737, which is a multiple of 7, the number of spiritual perfection. The other factor, 391, is the standard value in Hebrew of Yehoshua, this time with the letter Hey, symbolising God's approval, intact. The Superscription, encoded with cubes, sat atop the cross on which Jesus was nailed, which is formed by opening out a hollow cube. Therefore the Crucifixion of Jesus appears to have been symbolised in the code by means of the twin motifs of the cube and the cross. The cube represents holiness, the cross represents the instrument of the Holy One’s death, for the holy purpose of the ultimate atonement sacrifice. Next, we see that these two figures come together to depict the Crucifixion in a way that leaves us in no doubt that 9/11 was symbolising it. The motifs of the cube and the cross come together in a single figure which symbolises 9/11-as-the-Crucifixion and summarises all that has gone before. As I showed above, if a hollow cube of 218 units is opened up a cross is revealed. If we now repeat the same procedure with the solid cube of 343 units, by peeling off its outer shell, that hollow cube of 218 units, we reveal what you might now recognise to be a symbolic crucifix. This shows the Crucified Lord, represented by cube 125, mounted on the Cross, represented by the cross of 218 units. Within the September-11 Crucifix, cube 125 and through it the Pentagon, represents the Crucifed Lord, who, like cube 125, hung at the centrepoint of the Cross. Time North Tower stood 102 mins. Time South Tower stood 56 mins. The North Tower stood for 102 minutes after being struck, the South Tower stood for 56 minutes after being struck and these sum to 158. Even more remarkable, though, is the fact that the two numbers mirror the internal structure of the phrase. THIS (o) ........ = 56 South Tower stood for 56 mins. IS JESUS (o) = 102 North Tower stood for 102 mins. It appears that even the impact times and the fall of each tower were predetermined. Remember, the names of these towers, 'the north tower' and 'the south tower', summed to 386, standard value of the Hebrew Yeshua. So in the multisymbolic 9/11 drama, the World Trade Centre and the twin towers also played the part of the Crucified Lord. For further astounding 9/11 gematria, see Numerical Alchemy. The Stations of the Cross are fourteen depictions of the Passion found in every Roman Catholic church, beginning with Jesus being sentenced to death and ending with His burial. Although the number of stations was fixed in 1731 by Pope Clement XII, the eleventh Station appears to prefigure 9/11 by it's depiction of Jesus being nailed to the cross (the word ‘crucifixion’ is derived from two latin roots meaning ‘cross’ and ‘fix’), as shown below. Jesus was crucified about the third hour, according to Mark and the other synoptic gospels, and the sixth hour, according to John. These accounts seem to differ but only because Mark's account refers to the Jewish method of timekeeping. Mark and the others are saying Jesus was crucified between 6.00AM and 9.00AM our time. John is using the Roman method, which was similar to our modern clock, and was saying he was crucified at about 9.00AM. This is essentially the time the twin towers were struck! The North Tower was struck at 8.46AM, the South Tower at 9.03AM. The Pentagon was struck not long after, at 9.37AM. There was period of darkness that lasted about three hours before Jesus died on the cross. Jesus supposedly died about 3.00PM our time, which was the ninth hour according to the Jewish timekeeping method. Bear in mind though that timekeeping in biblical times was approximate and broken into three-hour chunks. So the 'ninth hour' could be any time from noon to 3.00PM. There was also a period of darkness in Manhatten on 9/11, especially after the two towers fell at 9.59AM and 10.28AM. It didn't last for precisely three hours, of course - some smoke and dust lingered for days - but the darkness that descended upon Manhattan after the towers fell must have been total for those within the zone of smoke and dust. The chapter and verse numbers sum to 55 (11 x 5) and, concatenated, give 2332, which is 11 x 212. This is significant because in Luke’s mention of the criminals both the verse itself and the number derived from the chapter and verse are multiples of 11, whereas in the other gospel accounts, neither are. It is a particularly fine example of the statistically-unlikely confluences of numbers and ideas from independent sources that constitute the code. Another striking example is found in the ordinal value of Matthew 23:32, which is the standard value (as usual) of the name given only in Luke for the place of Jesus’ crucifixion. In Matthew, Mark and John the area is known as ‘The Place of the Skull’; only in Luke is it called ‘the Skull’. That name is in fact found in the very next verse: Luke 23:33, which is marked with the key numbers 11 and 5. We saw that 5 (grace and heavenly favour) represents the wounds of Christ and therefore the Crucified Lord. I think the number 11 (disorder, destruction, imperfection) stands here for the two criminals (the reduced value of 'Jesus' is 11 but Jesus was 'numbered with the transgressors'). The other factor of 2 is also apt as it represents concepts such as duality, division and opposition. In Signs Of The Times and above I show that the Pentagon and the twin towers served as pictograms for the numbers 5 and 11. Additionally, the summed ordinal values of the three individual targets is 511. These same digits are found in the Hebrew name and title for Jesus: Yehoshua HaMassiach. I think the most persuasive evidence, though, is the fact that the digits of 5 and 11 also form the number 151, ordinal value of ‘Jesus Christ’! This number may therefore be thought of as a kind of ideogram representing the idea of the three men crucified at Calvary. In fact the three buildings struck on 9/11 - two tall towers and a five-sided building - depicted the digits 1, 1 and 5 and again insist that 9/11 represented the crucifixion of Jesus Christ.. The terrorist attacks that took place in New York and Arlington County, on September the 11th, 2001 AD, were a staged drama, portraying the crucifixion of Jesus of Nazareth, just outside Jerusalem at Passover in 33 AD. Like the Crucifixion, 9/11 was a watershed event in history: we now use the terms ‘pre-9/11’ and ‘post-9/11’ in the same way as we say 'BC' and 'AD', because we know that our world is now changed forever. The next page discusses the event that symbolised the Resurrection. 2. Other word strings with some of these values are found in the garden. The presence of these other word strings does not reduce the importance of finding the cluster, which is statistically improbable: the odds against finding the cube and cross numbers at all, for instance, is 1 in 30, and this clustering around '911' is even more improbable. I have left the other word strings out for clarity. 5. The apple is of the same family as the rose and, cut cross-wise, will show the same pentagonal pattern in the arrangement of its pips. The apple tree is sometimes compared to Christ, based on Song of Songs 2.3. Interestingly, New York is called ‘The Big Apple’. The apple is also an emblem of man’s fall (eating from the tree of knowledge) and his redemption, and as such is also represented in pictures of Mary and Jesus. 6. See http://workmenforchrist.org/Bible/BC_Jesus_Nets.html for instance.